The army have arrested five insurgents of Nationalist Socialist Council of Nagaland-Khaplang involved in the June 4 ambush of a military convoy in Manipur’s Chandel district which killed 18 armed forces personnel, sources said on Thursday. “Five members of the ambush team have been caught and the search for the remaining killers is on. All the above apprehended are being handed over to National Investigation Agency for further investigation,” an army source said. After the ambush, the worst such attack on the army in two decades, special teams were tasked to investigate the incident and crucial evidences were found, the sources said adding that they were able to establish the identity of the perpetrators. Based on inputs, the army established a vehicle check post in Utlou area of Bishnupur district and apprehended 22-year-old NSCN-K cadre S S Pte Giftson on Wednesday, they said. The source claimed that he revealed about his involvement in the ambush against 6 DOGRA regiment at Paraolon village and gave further information about the movement of his fellow team members. Another operation was launched on Wednesday and one more NSCN-K cadre involved in the ambush was held from Kakching Lamkhai on Wednesday. The apprehended was identified as H Bojesh Monsang, 24, a resident of Chandel district. On July 19 also, Mayanglangbam Manglemba alias Touthing Ngangba of NSCN-K was nabbed from Tuisimi village in the state. 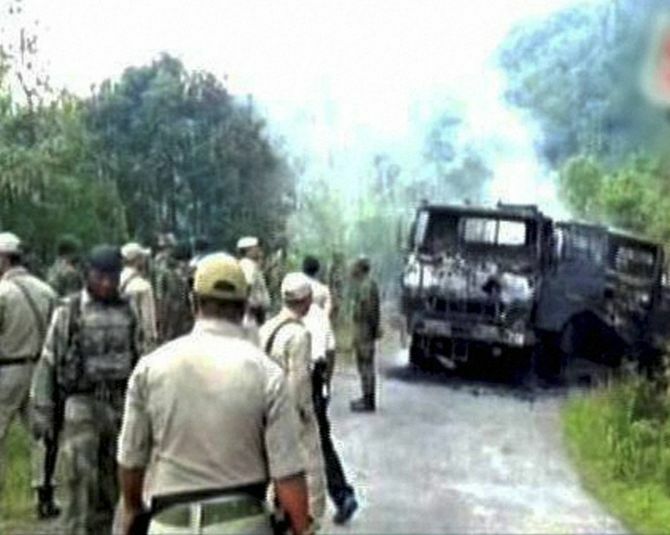 On June 4, a team of 6 Dogra Regiment was on a road opening patrol as part of its daily routine along Tengnoupal-New Samtal road, about 80 kilometre from Imphal, when it was attacked with a powerful Improvised Explosive Device. After the IED blast, the insurgents had resorted to heavy firing at the convoy of four army vehicles with RPGs and automatic weapons. Based on his information given by Mayanglangbam Manglemba, alias Touthing Ngangba, intelligence teams of army carried out further search for the remaining members of the ambush team after which Chingkhiurei Gangmei was apprehended at Tamenglong on August 4. In between, another cadre Rajanglung was also arrested, the sources said. In June, NIA arrested a key member of NSCN-K for allegedly being a part of the conspiracy. Hitting back after the June 4 ambush, Indian Army commandos had carried out what was claimed to be surgical strikes, hitting two camps of insurgents at two locations along Nagaland and Manipur borders with Myanmar, inflicting serious damage on the ultras. NSCN-K, which reneged from a ceasefire in March, has been involved in a series of attacks in tandem with some other militant groups under the banner of an umbrella group ‘United Liberation Front of South East Asia’.